June 8, 2016, 2:13 p.m.
By Ricardo Bilton @rbilton June 8, 2016, 2:13 p.m.
For such a new technology, the news notification is a format that got really safe really quickly. For most publishers, notifications are rarely more complex than a headline that, when tapped, sends readers to their site. Some publishers, like Quartz and BuzzFeed, have experimented with the language within notifications, trading the stiff formality of newspaper headlines for a more loose, conversational tone. But notifications, and their role, have remained largely unchanged. The Guardian Mobile Innovation Lab thinks there’s still plenty of room for innovation, however. 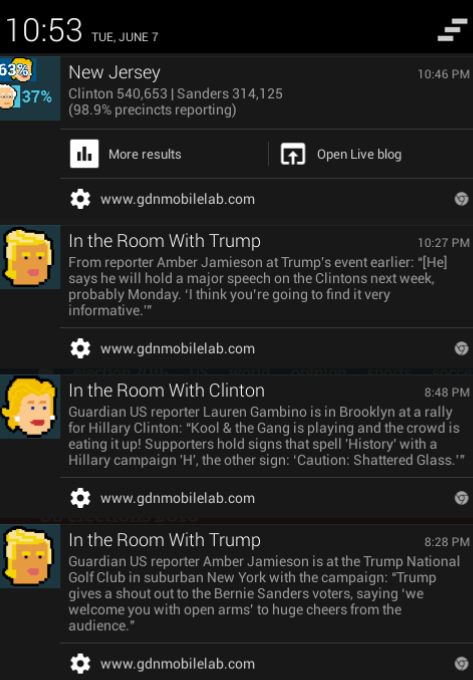 For its coverage of last night’s presidential votes, the publisher experimented with a handful of new notification formats. For each state holding a primary, for example, The Guardian created notifications that automatically refreshed themselves as more results came in. With another format, called “In the Room,” The Guardian pushed out alerts about specific candidates, including quotes and scenes from campaign events — each joined by a pixel art illustration of the candidate the notification was about. 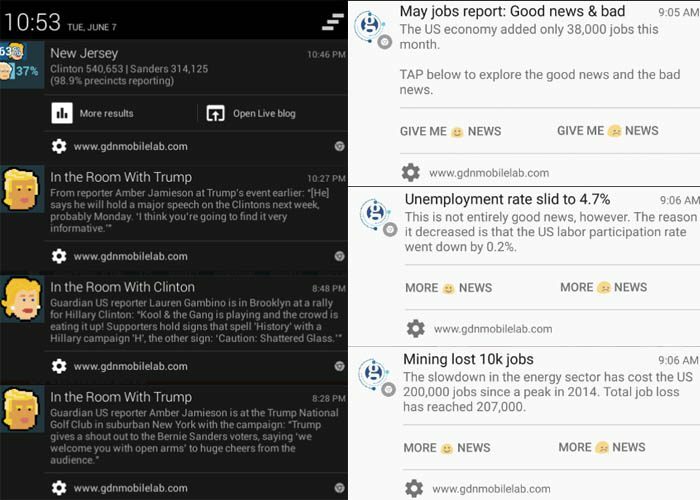 And the notifications, sent to readers who signed up to receive notifications from The Guardian Mobile Innovation Lab, weren’t sent through The Guardian’s mobile apps, but rather through Google’s Chrome browser on Android and desktop, which lets users opt-in to get notifications from specific websites. While all of the notifications let readers clickthough to get to a longer story, the primary goal was to create notification formats that told stories in a new way, were interactive, and could satisfy users on their own. “We didn’t want to do something where we just slammed a headline on your homescreen and expected you to clickthrough to an article,” said product manager Sarah Schmalbach. She said that stories such as the jobs report are ideal because they benefit from being told in a more digestible, interactive format. 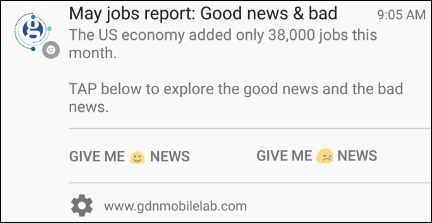 That kind of interactivity was a big part of what drew the Guardian Mobile Innovation Lab to Chrome’s web notifications, which are built into both the desktop and Android versions of the browser. Added last year, the feature lets websites send users app-like push notifications through Chrome itself. That’s nice for websites that don’t have the resources to develop their own apps but want to maintain a relationship with readers once those readers click away. It’s also good news for users, who don’t have to download a publishers’ app to get notifications about topics they care about. That’s a big deal on the mobile world, where publishers are lucky if they can get someone to download their apps, and even luckier if they can get users to interact with those apps on the regular basis. 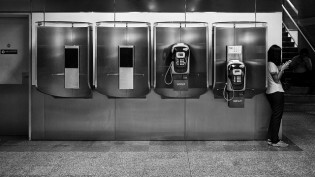 46 percent of people polled by Pew Research Center said they only used one to five apps per week. For individual news apps, it’s tough to give a critical mass of users enough reason to keep coming back. Opting for a web-based notification system changes that dynamic. The tech isn’t without its challenges, however. The biggest is that Chrome’s web notifications only work on Android and the desktop versions of Chrome, not on iOS. This significantly limits the number of potential users for The Guardian’s effort. Chrome’s web notifications haven’t been used or tested much outside of a handful of sites, which means that The Guardian’s mobile team regularly runs into new problem (such as some people not receiving notifications at all). Those limitations limited the overall number of people who signed up for the alerts, but the team says its happy with the results. Of the roughly 100 people who signed up, around 50 percent actually got the initial jobs report notification because of technical issues. Of those, about 20 percent made it all the way through the multi-notification narrative, which Schmalbach said was promising and will increase over time as the behavior becomes more intuitive. Ultimately, The Guardian’s notifications efforts fit into its larger effort to create fuller experiences for mobile, while not dumbing down the experience or playing into the idea that mobile readers means reduced attention spans. POSTED June 8, 2016, 2:13 p.m.
Bilton, Ricardo. "The Guardian is experimenting with interactive, auto-updating push alerts to cover big stories." Nieman Journalism Lab. Nieman Foundation for Journalism at Harvard, 8 Jun. 2016. Web. 18 Apr. 2019. Bilton, Ricardo. "The Guardian is experimenting with interactive, auto-updating push alerts to cover big stories." Nieman Journalism Lab. Last modified June 8, 2016. Accessed April 18, 2019. https://www.niemanlab.org/2016/06/the-guardian-is-experimenting-with-interactive-auto-updating-push-alerts-to-cover-big-stories/.